Now available! Enjoy the cold taste of summer with a perfectly chilled Kopparberg, served from the brand new HUS-HU237 Kopparberg Drinks Cooler. It’s the latest official, branded design to be launched from drinks cooler specialists, Husky Lifestyle. 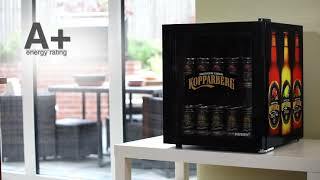 The contemporary black cabinet features side printed branding of three favourite Kopparberg flavours, whilst the double glazed door showcases the Kopparberg logo, providing tempting visibility to the contents inside. The compact, table top size is versatile for use throughout the house and is perfect for parties or for general use, freeing up space in the main household fridge. The impressive 46 litre capacity translates to storage of up to 40 x 330/440ml cans, perfectly chilled via an adjustable thermostat.